Upon buying a home in the state of Indiana, your real estate sales agent will ask if you would like a Professional Home Inspection. Some financial institutions may require a home inspection as part of the loan agreement. HyTek Home Inspections follows the Indiana State Standards of Practice. I am a Full Time Home Inspector providing a stress free Real Estate Home Inspection service. I will do my best to help you avoid paying for somebody elses problems. 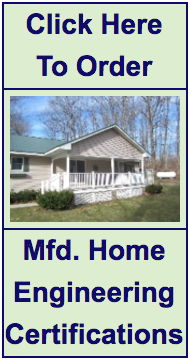 Local Engineered Foundation Certificate Inspections for Manufactured Homes are available at very competetive rates. Molds are organisms that may be found indoors and outdoors. They are part of the natural environment and play an important role in the environment by breaking down and digesting organic material, such as dead leaves. Most mortgage companies will require these three basic water tests. Check with your lender. We do a thorough visual inspection in and around your home looking for signs of active infestations and any past treatments. My Infrared Thermal Imaging camera will assist in my findings by seeing more than the naked eye. James A Horton is a certified Thermographer. Contact me now to schedule your inspection.